Ugh. Honestly? It hasn’t been a great week. Other than some very bright spots like one dear friend cleaning my house and another bringing over some delicious homemade meals for me to keep in my freezer, it was one of those weeks where I felt like I just could not control the chaos. It seemed like every time I turned my back to put out one fire (say, one child getting into a fireant bed outside) another would erupt (say, another child breaking a borrowed rocking chair that I’d told him to stay off of 1, 000 times and then using the broken piece as a weapon to harass his sisters). Logically, I knew that I have so very much to be thankful for and almost nothing to complain about in the grand scheme of things, but I couldn’t seem to pull myself out of my self-pitying rut and actually internalize that truth. Suffice it to say, I’m glad the weekend is here. I look forward to going to confession, hanging out with my husband, and gearing up for a fresh start next week. By the way…FIREANTS IN JANUARY? I really thought that these things hibernated or something during winter months. But when one of my children’s feet were covered in them yesterday I found out that, nay, that was too much to hope for. Even our scorpions have the decency to go away for the winter! It seems deeply unjust that we must endure bitterly cold weather and fireants. A while back my husband had the idea to learn about various periods in history by reading biographies of the major players involved for each era — reading about individual people’s lives is always more palatable than broad, impersonal overviews that list places, dates and names. Along those lines, he’s been raving about the books Cicero and Augustus by Anthony Everitt. In both books, the author does a great job of telling the story of each historical figure while weaving in all sorts of details about the times and places in which they lived. Anyone else have any historical biographies to recommend? Since my dad’s sun pictures were such a hit (#6 here), I thought I’d share another email I got from him with an interesting story from the construction site where he works as an engineer. Most people use laser levels these days, but simple water levels work just as well. 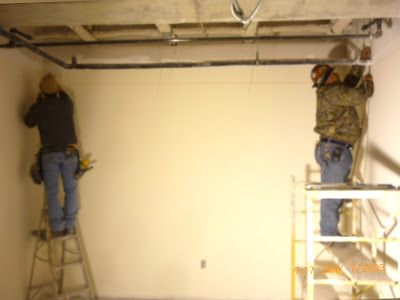 In the picture attached, the contractor needed to draw a level line around a room to mark the location of the ceiling grid. Juan took a clear plastic hose, filled it with water and held it up to the first measured elevation mark. The other guy took the other end of the hose and went to the other three corners of the room and made a mark where the water level was (which was, of course, identical to the level at Juan’s end). That is as accurate as any laser. After that they just drew a line from mark to mark. That is how the workmen built the entire huge refinery in Salamanca, Mexico. [A refinery my grandfather oversaw in his many years working in Mexico and South America. – JF] Only they didn’t have clear hoses so they had to get the water right to the top of each end. When clear plastic hoses came out they thought they had moved into the space age. Using water level goes back at least 5, 000 years. When the Egyptians built the great pyramids they dug trenches along where the base line of the pyramids would be and filled the trenches with water. The biggest elevation error from corner to corner of the big pyramid is 3/4 of an inch. Mark my words, O internet: this shall be the year that I finally invent some kind of shock-prevention device. I really, really dislike getting a painful zap every time I touch something metal during the dry winter season (I feel like this hangup is related to the equally bizarre balloon issue, though I can’t prove it). Every year I announce that I’m going to invent some sort of device to put an end to these constant mini-electrocutions that plague me for months out of every year, perhaps some sort of metal ring/thimble thing that I can wear on my index finger that will absorb the shock. “But wouldn’t that make you look weird?” you say? I assure you, the lengths I will go to to avoid getting shocked make me look far more idiotic than wearing around a thimble contraption affixed to my finger. Want to get to get things done like never before? Try writing a book. I guarantee you, every time you sit down and see the blank screen with the blinking cursor, you will suddenly feel an urgent need to clean the baseboards, get those crumbs off the kitchen floor, de-lint the couch, Windex the skylight, clean the gutters, do your taxes and mop the garage. If you can swing a contract that puts even more pressure on you to write something good and thus brings out writer’s block in its worst form, you can count on having your to-do list cleared off in about a week. See, you’ve already invented it. The shock-prevention device is simply to touch some non-metalic object, like the wall, immediately prior to touching the metal thing. By doing that, you ground yourself or some such thing so that you no longer carry the static charge. Pontius Pilate: A Novel by Paul Maier is historical fiction that I really enjoyed last year. Learning about history through biography is definitely the best and most entertaining way to go. That’s how we approach it in our homeschool. Your husband might like to read Nicholas and Alexandra by Robert Massie – it’s the biography of the last emperor of Russia; you can also get a volume of the letters they sent to each other. Jen, I’m sorry you’ve had a rough week. I’ll say a prayer for you this morning at Mass. We have spiders, but no ants or scorpions. We like American historical biographies by David McCullough. Also, have you heard of The American Patriot’s Almanac by William Bennett. We gave it to my dad for Christmas (and I bought a copy for my husband who loves history for a Valentine’s Day gift). I can’t wait to crack it open. re #3: I was never a lover of historical biographies or anything history-related until a good friend and my husband (who isn't a reader) convinced me to read The Frontiersmen, by Allen Eckert. It probably helps that Simon Kenton lived here in Ohio, and both husband and I know many of the places referred to in the book. All the same, I found myself wondering…how could I not have loved history? It also convinced me that history should be taught as a story (which it is) and not as you were saying, in broad sweeps. re #7: So, so, SO true. Me too! Oh–I’m so glad you got some extra help yesterday. It’s hard to say yes, isn’t it? Franklin and Winston by Jon Meacham. I’ve read it twice and it’s just great. The Madman and the Professor, author? It’s actually the “biography” of the Oxford English Dictionary. It’s awesome – and not just awesome for a biography of a dictionary, just awesome. I’ll keep thinking but those are the two off the top of my head. Oooo. Lee by Douglas Southall Freeman. So sorry to hear about your fireants. We have them here in Georgia as well. Has your husband read any of David McCullough’s books? I really enjoyed 1776 and John Adams is also good. He has written several other books as well. I think I’m going to laugh the rest of the day with the mental image of you touching people with your elbow before you’ll shake their hand. Would a metal thimble work? #5: Your dad sounds like such a neat guy. I’ve loved every story of his you’ve shared. I’m wondering – would wearing rubber-soled shoes “ground” you so you wouldn’t be zapped? I wish I understood science. And what do you call “cold,” anyway? 60? So that’s why I accomplish the most whenever something else urgently needs to be done. I find it especially true when leaving on a trip. Suddenly all the items that languished contentedly on my to do list for weeks demand to be addressed before I leave, even though they’re much less important than, say, packing my suitcase. Oh wow! I can relate on so many levels. First of all, fire ants? Loathe them. I remember when we lived in central Texas that I just despised them because they do NOT seem to have the decency to hibernate or just go away and allow some relief for a while. Thank you for reminding me of this. I’ve been so cranky and grouchy over how cold Oklahoma gets in the winter, but now I can choose gratitude for because those jerk fire ants haven’t made their way up here. Yet. Also – the balloon popping, canned-biscuit opening, and winter static shocks . . . check, check, and check. All three FREAK ME OUT. And yes to the amazing ability to do anything in the world except write when I really actually do need to write. May your weekend be peaceful, relaxing, and refreshing! I’ll probably be the 400th person to mention that those shocks are due to dry air. Try a humidifier, or some other way of evaporating water into the air (simmer some potpourri, etc.). Before you know it, those blazing summer temps and scorpions will be back in action and you’ll long for the shocks! I got quite a chuckle out of your electric shock phobia. I’m glad I’m not the only one. I must look like a goofball walking through Wal-mart touching every can, shelf and door tentatively at first (or with my elbow, too) and then making noises when I forget or get the shock anyway! Oh, do you make sparks when you kiss your husband, too? Yeah, I love those shocks that go right through my lips. Those are the best. 1. It’s -17 degrees here in northern Indiana today (without the wind chill). Texas, for all your toughness, you got nothing on the mighty North. Happy St. Fursey’s Day! St. Fursey was an Irish abbot who had an intense prayer life. I think my worst so far was a shock into the ear when I put on my earphones – didn’t see that one coming (though I did hear it). And it didn’t help that I was at work and unable to keep in the colourful exclamation. I mean, into the ear canal is just so invasive! Le sigh. You might enjoy the book London by Edward Rutherford. Also historical fiction, but SO informative. He is known for his amazing attention to detail and historical accuracy. London is one of my favorite books, actually. I second the recommendations of McCullough. Also, I know it’s not a bio, but if you’re trying to get an idea of an era, I cannot recommend enough Stephen Ambrose books. D-Day and Citizen Soldiers and Band of Brothers.. fantastic. Oh, and to add to Sarah P’s comment, the cool thing about Nicholas and Alexandra’s letters are that they were *written* in English, not Russian, so they’re not translated (they were both related to Victoria and Alexandra spent a lot of time with her as her favorite granddaughter). You’re getting tons of shocks down in Texas? Geez. We’ve been dying here in New England; I’ve never been shocked so many times. Right now it’s a balmy 10°F… I’m sitting here blowing on my fingers. Thank goodness, no fireants here, and even the birds seem to have finally flown south (they hung around a long time). But my sister and I suspect we have mice.. if you sit in the family room, you can hear squeaks… Good luck with those ants though! Love the 7 Quick Takes each Friday. I wanted to thank you for your advice on the BellaBand – I bought my first one back in Dec through a website called Mom4Life (10% of proceeds go to a pregnancy center, how cool is that?). I loved it so much that I bought two more colors! I will help you get the word to the masses. Also, I wanted to thank you for a post from a loong time ago, the one in March 2007 on advice from SteveG about looking for the tow truck driver. I just re-read it today and it’s absolute gold. Sometimes you re-post entries in a Flashback series, and that’s one of my favorites. Thank you for so many years of this great blog! *Snort* In Texas?? Are you serious?? I hate the static electricity too. So frustrating. And I can also relate to the dreaded getting out of bed moment in the morning. And while I realize it is not as cold here in TX as it is in other locales, it is cold to me. And I hate the cold. Bring on 100 degrees. This is fun, thanks. A friend of mine gave me the best advice I’ve gotten lately and that is to ask for help, there is no harm in asking. This advice has Blessed me in so many ways. On another note, I really had to rack my brain for these 7. I guess my head is not ready to wake up yet this morning. Water Level. Too Cool. I wondered how the ancients did that. It is cold here too. 2 degrees this morning. I’m a big wimp in the cold. I would stay in the house forever during this weather if I could. Fireants are from the devil. I know this! Thanks for keeping me posting at least once a week! I was particularly interested in your Dad’s story, having just gone through some serious construction around here with laser levels. Nice to know the tried and true low tech solutions work, too. Have you tried touching things with your car keys? (car frame, door frame, grocery cart handle). That works, you know. Wow – two weeks in a row for me – this might become a trend! I love the idea of deliberately reading biographies from each era in history. HA! Number 7 made me laugh. So true. I just wish I was always as inspired to clean the baseboards as I am to sit and stare out the window (all the while noticing how badly it needs to be washed). also i am reading a historical fiction piece called tales of passion, tales of woe ~ about josephine bonaparte. if you want to get away from ants and scorpions and spiders, go to the prairies, where its -30 C. No vermin there! What a neat story about the engineers and water levels! My dad is an engineer so he’d like that. I never thought of what they’d use before today’s tools were available. As for the writing… that’s funny. I should be editing a magazine right now, and instead I’m blogging. 🙂 Though often I use editing as an excuse to keep from actually writing… Ah yes, writer’s block! Good luck! I’m finally commenting after months of lurking! — I just got bit fireants the other day when rescuing our friend’s cat who was rolling around in a nest. — I highly recommend The Imperial Harem by Leslie Pierce – fascinating book about the Ottoman Empire from the perspective of the women in the harem. — We came from AZ… this place really has nothing on static electricity! Thanks for hosting. I would wear your anti-shock device. I HATE that. LOVE your last one, Jennifer. HA! Maybe I should try that! I love biographies! I recommend the one by Walter Isaacson called “Benjamin Franklin.” He also wrote one recently about Einstein that I haven’t read yet, but which I’m really looking forward to. He’s an excellent biographer. Another favorite of mine is “Parallel Lives” by Phyllis Rose. I haven’t read it in years and I’m not sure how I’d feel about it now after my views on marriage have changed, but it still sticks out in my mind as a good collection of “mini-biographies” about married couples from the Victorian era. I love this carnival. I really, really do. Thank you for starting it, Jennifer. If you want to get rid of the fire ants, by the way, you could always come north. Our high is below zero (again) today. We’re like a blast freezer; nothing survives. You have hit the nail on the head with number 7! Never was my house in better condition: clean, organized, sanitized and (probably) martinized, than when I was finishing my school work last semester. Boy, now that my degree is firmly in hand I’m not sure how I’ll motivate myself to clean! The water level thing was so interesting. I really enjoyed it and the link that showed how to do it. Your blog is inspiring and so well-written. Even with a tough week, you find time to write. Thank you! I love #7. I find when I’m in church praying my holy hour, chores at home can suddenly seem very pressing; I remember stuff I want to do that I don’t even think about at any other time. I’m missing out on 7 Quick Takes Friday this week, but wanted to let you know that I awarded you an Octamom award on my blog today! Oh, and honestly? I’m all over #1 with you this week. TGIF. is mr. linky closed? i don’t see him. what do i do? Anna – Unfortunately it looks like there’s a technical problem on Mr. Linky’s end. I didn’t intentionally close the list. Hopefully he’ll get it fixed soon!! i am very sporatic in my 7 takes, but i love it! thanks for doing this! and i love reading your blog. i am a believer, but not a catholic. i love reading about catholicism, i find it intriguing. Mr. Linky seems to be nonoperational . . . I’m late because I wrote the post but forgot to stop by and add my link! Happy weekend to all! Be sure to stop by and submit a post to the upcoming Carnival of Family Life for Monday’s special Inaugural / Civil Rights Edition! When I complained about the cold this week, my husband reminded me of how much I despise the sunscreen and bug spray routine that I despise in the summer. It may be cold here (-20 this morning), but at least we don’t deal with bugs at the same time. I’m a relatively new follower of your blog, and must say I’m a fan. Re: no. 7, have you looked at Paul Silvia’s book How to Write A Lot? It’s primarily about academic writing, but it’s a quick read, and the basic principles (write a little every day rather than in large chunks) applies to any kind of writing. No historical Biographies to recommend, but A Well Educated Mind has a nice list. Sorry you’ve had a bad week, I know about putting out fires right and left. There’s a lesson in there somewhere, I know. Mrs. Jennifer, I enjoy reading your Quick Take Friday, and wanted to do something like it so my mom suggested that I start a Quick Takes for teens on my blog! Thanks for the inspiration! Ha! I always hit metal handles (on doors, at the grocery store, wherever) with the side of my fist before opening them during the winter. I’m sure I look crazy, but it helps me prepare for the shock, I can handle it better on the side of my fist than on my fingertips! Augustine of Hippo by Peter Brown. Simply superb. I just started reading “Augustus” and it’s terrific! Tell your husband thanks for the recommendation. Following my own investigation, millions of persons on our planet receive the loans at well known creditors. Thence, there’s good chances to receive a sba loan in any country.